INFORMATION PLEASE features four terrific episodes from one of radio�s truly classic series. 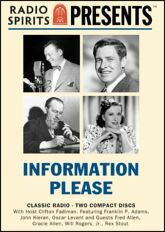 Information Please is a winning combination of personalities from various walks of life engaging in lively and witty banter, overseen by genial host Clifton Fadiman and regular panelists Franklin P. Adams, John Kieran and Oscar Levant. Guests in these four programs include Fred Allen, an impressive Gracie Allen, young war veteran and then US Congressman Will Rogers, Jr., and mystery author Rex Stout.